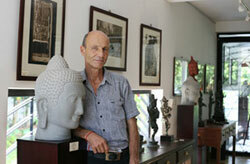 Thierry Diwo, photographer and publisher built with his wife the "Diwo Gallery 1" in 2010, than open "Diwo Gallery 2 the shop" in 2011 in Angkor Siem Reap. Thierry Diwo a Cambodia-based French photographer and publisher, has been visiting Angkor's Temples since 1992, when he came, in Cambodia for the first time to realize reports for a medical NGO and for UNICEF. In fact, he decided to stay, and has since married a Cambodian woman.Lea was born in 2002. He continuing his fascination with the ruines of the great Khmer Empire, he has led to a largely black and white photographic oeuvre, some which appeared in books, postcards. In 1994 Thierry established a department of photography at the Royal University of Fine Arts, in Phnom Penh, where he teached 3 years. In 1997 he began a publishing company (now know as Diwo Publisher), producing postcards, posters, books, and photography. Thierry studies of Angkorian civilization and religion have also led to books on the four main temples: Les Gens d´Angkor, Angkor Forever, Bayon Forever, Sacred Stones Forever, the Angkor birthday calendar. "Writing books, do new pictures about each temple has been a rigorous exercise. Through my books, I hope to share my passion and fascination for those stones and people" he says. His historical adviser was Christophe Pottier of the Ecole Française d´Extreme-Orient that has been involved in the restoration of Angkor. His Cambodian pictures are from the 1992 years to now. He has a photo collection of empty Temple that is really not possible to realize to day because since few years the temple are crowded with visitors. Could you imagine the Angkor Wat Causeway without people? Thierry have photos, from inside the monument, but also from helicopter! Now the children's vendors can't enter inside the temple, Thierry did many photos with them, but also with the monks, elder, praying. ''I told them to pose with the statues, I have been fascinated by the similarity between these living faces of flesh and the faces of stone from an otherwise long-past period in this country's history" he says. This actually brought them closer to the true colors of the temples which are mostly a greenish grey, some photos turned golden, others mossy brown or yellow tinge. The Thierry Diwo's photos, books and postcards are for sale in five stars hotel shop in Siem Reap and in the monument books stores in the Phnom Penh and Siem Reap airport. Many size are available. There are on ivory carton paper.